Lenny gave an early preview to promote Woman4Woman, a site Sandra Bland had worked on. Sandra Bland may no longer be alive to tell her story, but Lena Dunham’s new online newsletter is doing its part to make sure it lives on. Prior to Bland’s July arrest and subsequent death, she was working on an online platform for women called Woman4Woman with her friend and mentor, Chenai Okammor. At the same time, Lena Dunham, Jenny Konner, and their team were gearing up for the fall launch of Lenny, an email newsletter. But everyone who’d already signed up for Lenny received a surprise in their inboxes Monday morning: a special edition about Sandra Bland on the day of the Woman4Woman launch. In a Q&A between Dunham and Okammor, we get to hear a different side of Bland’s story—one separate from the police video and the autopsy report, and one that gives us a portrait of a 28-year-old woman searching for meaning, purpose, and a strong sense of herself. “She reminded me of myself when I was younger,” Okammor, 51, told Dunham of her late friend. Okammor met Bland met at church, and the two connected over their shared love of writing and of encouraging women to find their voices and share their stories. They exchanged numbers and then began exchanging ideas. Eventually, the idea for Woman4Woman was born. Sandy was raised by a single mother with a bunch of sisters. And she said that when she was growing up, she held back her thoughts at times. What became clear to me as I met more with Sandra was that she was finding her own voice. After a couple of meetings, Sandra shared our project with her sisters, encouraging them to join our group. She had such a commitment to having women tell their own stories and she helped them talk about things they hadn’t talked about before. Sandy said to me, “I’m 28 and I’m just now beginning to identify what I stand for. I do know that when something is wrong, it bothers me so much that I take it to heart.” When she started working on this project I asked her what she wanted to accomplish with it. She said, “I want to be able to share my story with young women out there.” Because she still thought she was alone in her quirkiness. This particular piece of information piqued Grose’s interest, and she reached out to Blow to find out more. After getting Okammor’s permission, Blow connected her to Grose, and she was immediately on board to speak with Dunham about Woman4Woman. The inaugural Lenny letter was sent out at 6am on Monday and made available on the website at noon. “We wanted to make early subscribers feel like they were getting something special,” Grose said. Their official launch is tentatively scheduled for Sept. 29. While the email will exist in perpetuity, they also chose a more ephemeral way to spread the word: Snapchat. 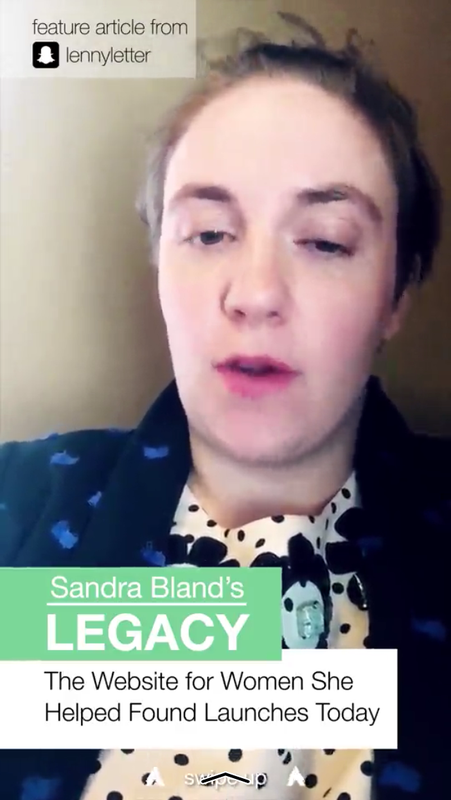 In a special video message from Dunham in the Snapchat Discover story on Monday, she teases her interview with Okammor. She also says they hope to do more work with Snapchat in the coming months. 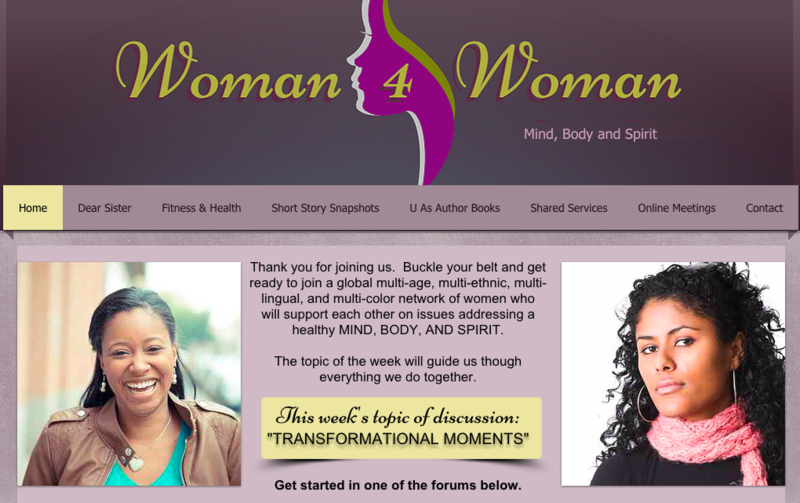 Each week, Woman4Woman will explore a specific topic with a question as a prompt. The question on launch day is the following: “What do you believe to be the most transformational moment/moments that impacted the woman you are today?” Without a doubt, for Okammor, Bland’s death will be one of those moments.